You might have heard a lot about Purple but this review of Purple mattress is going to expose everything you need to know before you buy one. When it comes to our bedrooms, we tend to settle for the best choices. After-all, everyone deserves a well-rested and comfortable night. Our cushions, sheets and even settings; they all contribute to this comfort, especially our mattresses. Talking about mattresses, there is a whole genre of debate that goes on when it comes to best one in the market. Be it spring, foam, latex or even memory foam mattress, the decision is always taken carefully. Plus, we all have really high expectations from mattresses. They should be durable, comfortable and must last a long time. With all the options around we tend to go for the most latest one in the market and sometimes it doesn’t end well at all. But what if someone introduced a better and even more innovative kind of mattress? How about a hyper-elastic polymer mattress? Seems new and interesting, but is it worth it? Well, this is what this Purple mattress review will explore; the one of a kind, hyper-polymer layered mattress. We have all grown up with knowing only the traditional kinds of mattresses. The Purple mattress has, however, developed a new-hand technology that uses hyper-elastic polymer. This means that it can stretch, support and even stay firm, all at the same time. In simpler words, it will be soft where you want it to be soft and firm where you are not stressing it. So imagine sleeping on a mattress that literally absorbs your body and with its pressure-releasing technology you don’t have to worry about the full support and that too without any body impressions! Most mattresses give out after a couple of months and you can feel your body impression forming on them. However, this mattress being super stretchy and firm would never fail to impress you. What makes Purple Bed so special? Basically the special part is the quality of manufacturing. The mattress is 9.5 inches in thickness and consists of 3 different layers of foam and polymer. First comes the bottom polyurethane foam layer of the mattress which is and acts as the strong foundation of the mattress. Then comes the middle polyurethane foam layer which creates the transitional support and provides that deep sinking feeling to the sleepers. Finally comes the upper and visible “purple” hyper-elastic polymer layer. This layer utilizes the grid style composition which keeps the mattress cool and comfortable. 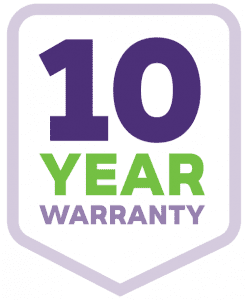 The whole mattress comes enclosed in a hypoallergenic and breathable cover. Even if you take off the cover, you can easily look at the three different layers and yes, the hyper-elastic purple boxed layer will seize your attention. 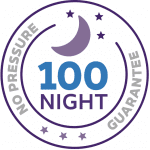 You can try it for 100 nights or your money back. Purple offers a full refund if you don’t like the mattress for any reason. The mattress is unbelievably soft! It is the perfect balance of firm and soft. You won’t feel losing balance on this one and won’t feel discomfort as well. Mostly we go for those mattresses which are soft like the memory foam. Such mattresses do more harm than good in all honesty. But this one just knows how to cradle your body perfectly. 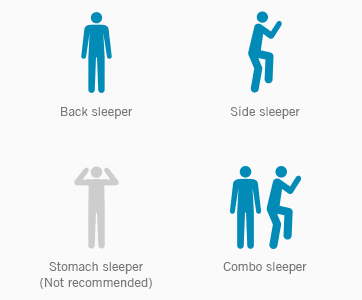 While most doctors recommend sleeping on such a surface which would support you, align your back and not disrupt the natural spinal shape, almost all mattresses tend to compromise on either one of the mentioned conditions. But a purple mattress knows how to lock you in the perfect position all while fully supporting your back. Highly recommended for side and back sleepers. While the mattress appears like a dream to sleep on, your body will take sometime to adjust to it. This is because we have been using spring and foam mattresses since birth and all of a sudden this hyper-elastic polymer mattress appears different to us. The pressure releasing technique that this mattress employs is just magnificent. What happens is that when you lie down, your back might be relaxed or in proper position but the pressure is still there or is just shifted to your hips and shoulders. That’s because of the mattress. But Purple knows how to correctly adjust your posture or position while limiting this pressure greatly. So yes, it will take some time for you to get used to feel of getting properly locked and supported but it won’t be discomforting at all. The most common problem that tends to bother us is that the mattress, despite being the absolute luxury, tends to warm up with our body heat. Although this coziness is lovely when one is experiencing cold nights but it can be equally exhilarating if one is experiencing the hot summer nights. The purple mattress knows how to maintain the right kind of temperature. Actually, its remarkable construction plays the main role here. As mentioned above, the grid style hyper-elastic polymer layer allows air to pass through it constantly. This in return keeps the mattress cool. Hence, you can be properly cradled up in the mattress and not feel overly warm. How perfect is that? Sleepless nights call for tossing and turning. However, all these movements can be felt by the person sleeping right next to us. That’s due to the phenomena known as motion transfer. The purple mattress provides you with total motion isolation. This means you can toss, turn, move and the person sleeping next to you won’t feel a thing. After the famous egg test, mostly people have tested this motion isolation and have been amazed. So in case your partner is not a calm sleeper, better get this mattress soon then. You will be surprised just how awesome the price is! Although it is largely compared to the top most memory foam mattresses. And believe it or not, it does prove as a strong contender. Despite all the fantastic stuff that comes along, you will still find this mattress cheaper than the rest. Secondly, another best thing about this mattress is that it can be ordered online. The whole online purchase greatly reduces the extra hidden charges that come along with other mattresses. All this stuff does have an impact and make purple a great choice. You might change the topper, sheets, pillows, and even your whole house but your mattress remains the same. This is why one should always invest in such a mattress that would last a pretty long time. Now most mattresses do promise life-time guarantee but we all know that doesn’t go well. Yes, a good mattress will stay firm and great and would require one to change it’s side every now and then. But this is not the case for the purple mattress. First of all, the mattress is super stretchy and does stay that way. Secondly, it comes with a great warranty. This means that once you start sleeping on it, you don’t need to worry about your body impression forming on it. and last but not the least, you would never need to turn your mattress upside down ever. The one problem that people often complain with latex or foam mattresses is the characteristic odor that it adheres. Especially whenever someone thinks of plastic we all can smell that characteristic odor in advance. Now what about a mattress which carries a special plastic kind as it’s main quality? The answer is no odor at all. Yes the mattress is heavy to carry, but it has absolutely no odor to it. It is completely hypoallergenic and safe. Hence people who have a weak resistance to polymer or are prone to allergies due to plastic, even for them this mattress is completely safe to use. If you have had sleepless nights lately or find yourself excessively tossing or turning, then chances are that you are not comfortable enough. While we all tend to look for mattresses with the longest life, not all are fit for our bodies. Not all of them do anything good to our spine and we don’t get much say when it comes to the “right” texture. Either we settle for “too soft” or “too hard”. Keeping in mind all these queries, the suggestion that leads the way is the purple bed. With it’s state of the art technology which uses hyper-elastic polymer basically, you get the right kind of comfort with the most secure pressure relief ever. Plus you don’t have to worry about any body impressions or any allergic reaction, for it is safe and stays in shape. 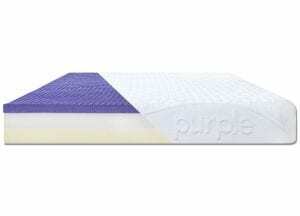 Someone asked me about purple mattress vs leesa and another friend of mine asked my preference for purple mattress vs ghostbed, my answer is Purple all the way. It even beats tempurpedic and tuft and needle when it comes to comfort. Even if you don’t have any back problems, the purple bed is sufficient and provides everyone with what they need. Ideal for people who share their beds because they won’t feel the other person’s movement at all, due to the motion isolation properties and the mattress always remains cool, due to the air flow. Very easy to order and even easier to set it out. All you need is a sturdy surface where you can place it, unroll the mattress and you are ready to experience the new way of sleeping! If you’ve got your purple mattress, make sure you get hold of Purple Powerbase and Purple pillow as well. Let me know your thoughts about this purple mattress review. Feel free to drop your queries in the comments below.